Photo: Front entrance sign. 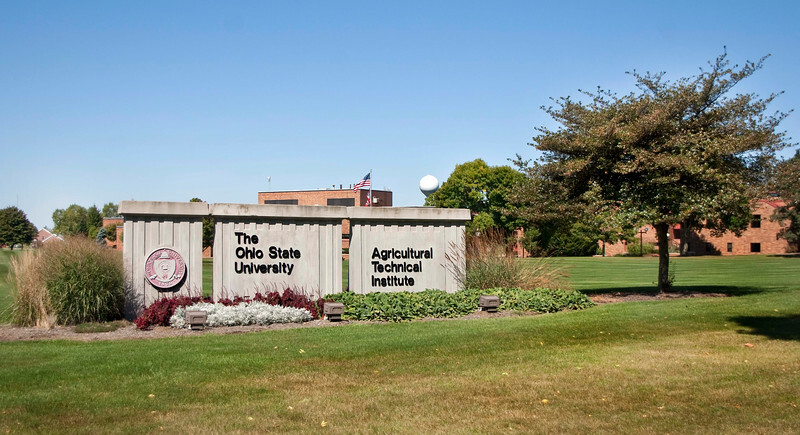 Agricultural Technical Institute (ATI) of The Ohio State University. Description: Located in Wooster, Ohio, ATI is an associate degree-granting program within the College of Food, Agricultural, and Environmental Sciences at The Ohio State University. Students participate in a curriculum that includes general and basic studies, hands-on experience and a paid industry internship. Ohio State ATI is the largest institution of its kind in the U.S., enrolling approximately 800 students and offering 28 programs of study. Ohio State ATI maintains a 99 percent job placement rate for all graduates within four months of graduation. Ohio State University's Ohio Agricultural Research and Development Center is adjacent to the campus. Role in Wayne County's Ag-Bio Cluster: Higher education leader, travel and tourism generator, workforce training related to horticulture, floral design and marketing, beef and cattle production, crop management, environmental resource management, greenhouse management, horse production and management, landscape design, nursery management, swine production and management, and various aspects of business related to agriculture.